Never mind that if you adjust for inflation and go global, Apple isn’t actually the first trillion-dollar company. PetroChina, the state-owned Chinese oil company, hit that number more than a decade ago, and in adjusted terms, Standard Oil did a century ago. Still, it’s rarefied air, and a genuine milestone. But what does it portend? Can Apple maintain its edge? Can it develop a suite of products year after year that meet the same range of needs and attract the same loyal customers? As extraordinary as it is that Apple has come this far, it would be even more extraordinary to sustain such heights. Apple is simultaneously in a perfect and challenging place. It is ensconced and profitable. It is growing, and its offerings sell at a premium price because it has established a premium brand. And yet, its products appear set and essentially static. Its most dramatic new device in the past five years is the Apple Watch, which hardly moves the technological needle. It is spending ever more on research and development but has so far shown no big payoff. It might of course, but in every area where it’s investing—from AI to cars to robotics to voice—there are a host of deep-pocketed competitors and hungry upstarts. The greatest challenge, of course, is the complacency of success. Apple faces no immediate threat to its standing, though it has multiple competitors on price, design, and function. It is not Nokia circa 2005, though that certainly should serve as a warning. It is making more money every day. It is led by a highly competent management team. The only urgency is an existential one, and the awareness that every prior company that has reached Apple’s status has subsequently stumbled. In 2000, just as the dotcom bubble was cresting, WIRED published a story about Cisco, which was then the No. 2 company by market capitalization, just behind Microsoft, at a tad under $500 billion. The prediction was that Cisco had all the makings of the first trillion-dollar company. Today it stands at $200 billion. To be fair, that’s hardly an Icarus tale. But it does point to how devilishly hard it is to reach the top and stay there. Apple isn’t going anywhere anytime soon. (Full disclosure, I use Apple devices, and I’ve invested in the stock personally and professionally for years.) But there’s a host of reasons to think that we are closer to the end of Apple’s dominance than its current valuation suggests. First, it helps to recognize how quickly the company has ascended, which should remind us how quickly it could descend. Yes, it was one of the early innovators in personal computers, care of its cofounder Steve Jobs. Its cultural significance, however, dwarfed its financial success; when Jobs returned in 1996 to the ailing company he founded, it was worth barely $3 billion. He rescued Apple Computer from oblivion, but only with the debut of the iPhone in 2007 did Apple become what it is now. The iPhone is the axis of ecosystem that will generate more than $250 billion in revenue this year, and more than $50 billion in profit. 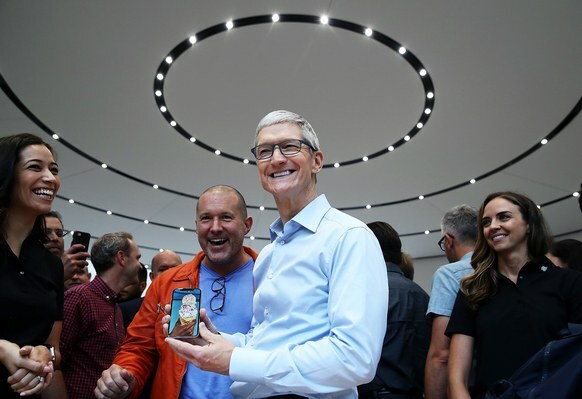 Apple’s market value reflects a company with an enviable global footprint, that sells close to 200 million iPhones a year along with 70 million assorted Macs and iPads and watches, and has amassed close to $250 billion in cash from its earnings. Phone sales alone account for nearly two-thirds of Apple’s revenue; much of the company’s recent success stems from convincing consumers to replace their phones every two to three years. The phone, as we all know, is much more that. It is a personal handheld computer that acts as a shopping mall, an entertainment center, a data center, and a navigation device for the physical and social worlds. It is the epicenter of a developer and app world that has allowed for everything from Uber to Instagram, Google Maps to YouTube. Indeed, the fastest growing, and most profitable, part of Apple’s business is Services, which includes iTunes—streaming music and movies—as well as the company’s share of app sales and iCloud hosting. Apple could fold today and still be one of the most successful companies the world has ever seen. That is its blessing; it may well be its curse. While the company continues to mint money, its suite of products no longer stands out. An iPhone, an iPad, a Mac sold by Apple has some unique design quirks, but the basic functionality is now a global commodity shared by Samsung, LG, Huawei, Xiaomi, and others. It most recent generation of products has shown modest improvements and innovations in camera resolution, screen size and sharpness, but fewer of the breakthroughs that characterized earlier generations. Meanwhile, its tech peers, including Amazon and Google seem to be outpacing it in voice technology as they aggressively move into new areas such as Amazon Web Services and Google’s investments in self-driving cars to satellite imagery. It is hard to overstate how difficult it is for a highly profitable company to force a sense of urgency that it may soon be in jeopardy. Bill Gates and Microsoft tried to cultivate a culture of continual paranoia, but with billions pouring in, paranoia is quickly deluged by cash. Apple employs secrecy and control, yet it cannot hide the fact that it now spends more to buy back its own stock than it does even on research and development. Because Apple is so secretive, it is hard to know whether its ramped-up spending on R&D will yield products and services to sustain its incredible success. It is, however, instructive to note that few dominant companies have been able to anticipate the next wave of disruption and innovation that endangers their current franchise. IBM came close when it moved into software, consulting and high-end AI, but even then it lost momentum and half its market cap. For years, Exxon seemed untouchable; it was disciplined in how it spent, and generated profits year after year. It still does, but the world has changed far more than it has, and it has shrunk and continues to. To some degree, these are cry-me-a-river issues. Apple has made many people rich, and it has transformed the world with the iPhone and its ecosystem. If $1 trillion is at or near its apex, it will still have been a unique success. But it may be the corporate equivalent of the United States in the 1950s, reaping the rewards of its assiduous work in a blessed moment that will not and cannot last. Is it possible that Apple will be at the center of the next technology wave? Of course. But it would be the equivalent of lightning striking twice in exactly the same spot and hitting precisely the same person. Apple is America’s first $1 trillion company; it almost certainly won’t be the first $2 trillion company. Companies have a life cycle; and as much as they like us want to live forever, almost all are, ultimately, mortal.